Sausal Creek is responsible for digging a floodplain that is rather wide just upstream from I-580. Here’s the view across it from Montana Street at MacArthur. The squat tower just to the left of the speed limit sign is at the foot of Lincoln Avenue, and it’s at the same elevation as where I’m standing. That’s how wide the valley is. Here’s another view looking right down MacArthur. 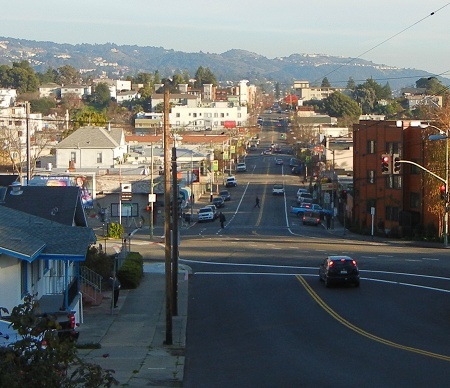 The first cross street is Canon Avenue, the next one is Dimond Avenue leading up to the park, and beyond is the Fruitvale Avenue crossing. Here’s how the geology is mapped. You can see that the stream valley is wide because three streams coalesce here at the edge of the Piedmont bedrock block. 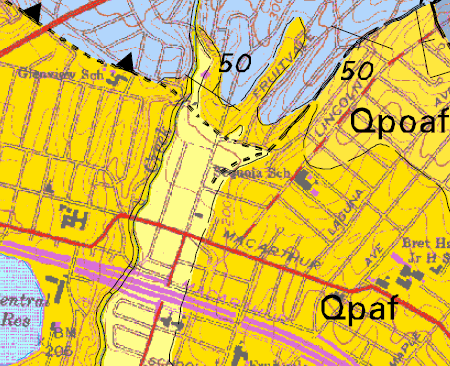 Restricted upstream, they enter the big alluvial fan (Qpaf) and have room to move and easy material to erode. It is curious that Sausal Creek hugs the west side of the valley; I suspect that tectonic movements may account for that, but only a decade or so of careful satellite altitude monitoring can answer my suspicion. 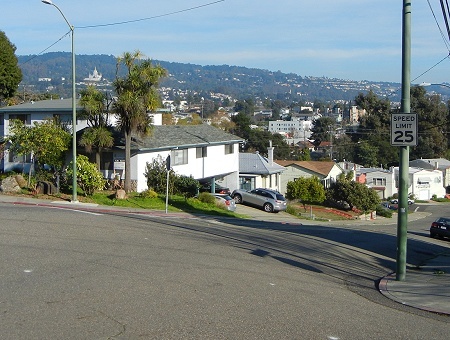 This entry was posted on 6 February 2013 at 1:26 pm and is filed under Oakland geology views, Sausal Creek watershed, the Fan. You can follow any responses to this entry through the RSS 2.0 feed. You can skip to the end and leave a response. Pinging is currently not allowed. I drive this area constantly – before it was just a hill – now I appreciate it much more.